At Directi, I along with many of my tech-inclined colleagues, have been volunteering significant personal time and energy towards constantly enhancing the programming talent across the country through several social and community initiatives across the last few years. Codechef has been our flagship non-profit initiative in this regards. We have since held seminars, provided coaching, conducted campus engagement activities and much more. Sponsoring the ACM ICPC world finalists is another such initiative on our part, to assist our champions in putting India on the map within the coding circuit. We at Directi have personally interacted with all the members in these teams – all brilliant individuals – and we are proud to have sponsored them for the ACM ICPC world finals. I invite you all to join us in wishing them luck as they compete with 103 other teams around the globe for fame and glory! TheKingsGambit (TKG), name derived from a famous opening move in Chess, was formed in 2008 and went to represent India in the World finals 2009. 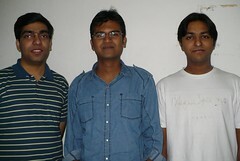 Presently, TKG expands to the names Anshuman, Gaurav and Rajat. The strength of the team lies in the diversity of skill set, the positive attitute and co-ordination. The final year computer science trio believes ‘work hard, party harder’. Let’s hear it from the team itself – TheKingsGambit: “All our engines work on the fuel supply of coffee/tea . Most of our free time is spent watching movies, TV shows or playing games (sometimes outdoors). Some not so common facts about us are that we all studied in the same city and have met before beginning college. One of us has almost drowned in three water bodies while another one of us has driven a real war tank. One of us has acted in a movie and people definitely don’t know which one of the above has been made up. CounterGambit, are a rare blend of analytical problem solving, algorithmic skill and programming prowess intended to throw some fierce competition at TheKingsGambit, and has found its way to the ICPC World Finals. 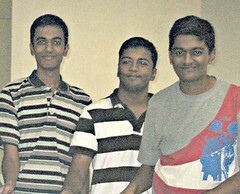 The crew consists of Venkatesh, Abhilash and Akhil. Venkatesh is an algorithm contest veteran with a great deal of experience since high school, including the IOI 2007 and the ICPC World Finals 2008. His mathematical and analytical skills form a crucial part of the way the team functions. Akhil is a seasoned programmer, and brings lightning fast implementation into the equation, especially with dynamic programming, graphs and searching. Abhilash comes from an application development background, and has his way with the language, and works data structures to do his bidding. All three, evidently, possess brilliant analytical skills, love to solve problems, and love to compete. How can you wish the teams? Leave a comment on FaceBook or Tweet luck to the teams! all the best guyzz !! make India proud. All the best! To TKG in particular, I hope this isn't your last world finals, you guys would make fabulous coaches. all the best guys!! hav a gr8 time @Harbin !!! All the Best. Special Wishes to TKG ! Actually, there are 3 teams from India. Third one is Phoenix. But, there is no mention here. Best of Luck to all 3 teams. Hey, we're not sure what you are talking about… would you mind explaining? All the best Team India .Macha kar aana World Finals main. All the best Team India . Macha kar aana World Finals main.